A powerful clear voice over well crafted lyrics in the style of Bruce Cockburn or Jackson Browne. Three tasty acoustic instrumentals from a gifted Canadian guitarist round out this remarkable record. 2007 Winner in "Songs from the Heart" Competition for his song "Feather Fingers"
D'Arcy has had a wealth of excellent performance experience over the past few years. Feb. 14, 2009 marked D'Arcy's first appearance as a featured performer at Toronto's Winterfolk Folk Festival. June of 2008 was the occasion of another first appearance, this time at the NXNE Music Festival in Toronto. In April of 2008, D’Arcy was one of three featured performers and workshop leaders at the Waterloo Guitar Summit. In December 2007, D'Arcy showcased for the Hamilton Folk Club. On Nov. 17, 2007, he opened for Jon Brooks, and accompanied Jon on a few tunes, at the Acoustic Harvest Folk Club in Toronto. On Sept. 20, 2007, D'Arcy joined Ian North and Clela Errington to open the first City Roots Presents series at the Cameron House in Toronto. D'Arcy was the featured opening act on March 24, 2007 for Oliver Shroer at the Greenbank Folk Society in Greenbank, ON. D'Arcy performed to a sold-out audience at Hugh's Room in Toronto for the release of his CD, "Feather Fingers", and opened for Tommy Emmanuel there in 2005. D'Arcy's first solo recording, "Dust and Loneliness", which was produced by Ian Thomas and released in 2000, received critical acclaim. Tracks from the CD were featured on two composite CD’s: Borealis Records' "6 Strings North of the Border" vol. 2 and "Tears of a Thousand Years". 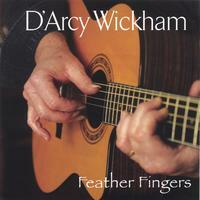 In 2005, D'Arcy released another critically acclaimed CD, "Feather Fingers", which was produced by Jason Fowler. Greg Quill of the Toronto Star was particularly impressed with D'Arcy's facility and virtuosity on the guitar. In August of 2007 the Ontario Council of Folk Festivals contacted D'Arcy to congratulate him on winning the instrumental category in the " 2007 Songs from the Heart Contest", for his tune "Feather Fingers". D'Arcy showcased his tune at the "Songs from the Heart" awards ceremony at the OCFF conference on October 13. As a guitar teacher with some 30 years of instructional experience and as an award winning composer, D'Arcy has a wealth of musical background to drawn on in offering workshops: aspects of guitar technique, song writing, history of folk and blues, and live performance. Well known in folk music circles, an outstanding guitar teacher, performer and composer, D'Arcy would make a great fit for any folk festival or roots music venue.